Welcome to Pine Ridge, Poole, Dorset. A luxury four star, silver award winning, bed and breakfast exclusively for adults. 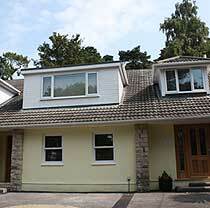 Situated on one of Broadstone's premier roads, just 4 miles from Poole, it offers 4 well appointed en-suite rooms. A relaxed and friendly atmosphere with the focus on you, the guest. "Well equipped and comfortable rooms"
Well equipped and comfortable rooms will help you get a good night's sleep. Wifi enabled to keep you connected whether visiting for business or pleasure. A short stroll and you have a choice of restaurants, all licensed with no need for a taxi. You can even charge your car while you sleep with my newly fitted charger point. Start the day with a freshly prepared locally sourced breakfast in the guest breakfast room/lounge. If you want hotel quality accommodation with the individual attention that a small guest focused business can provide, then come to Pine Ridge.